tutorial and explore the programmer's guide to command-line apps with Dart. We hope to see what you build in our Dartisans G+ community. Today's release of the Dart SDK version 1.3 includes a 2x performance improvement for asynchronous Dart code combined with server-side I/O operations. This puts Dart in the same league as popular server-side runtimes and allows you to build high-performance server-side Dart VM apps. We measured request-per-second improvements using three simple HTTP benchmarks: Hello, File, and JSON. Hello, which improved by 130%, provides a measure for how many basic connections an HTTP server can handle, by simply measuring an HTTP server responding with a fixed string. The File benchmark, which simulates the server accessing and serving static content, improved by nearly 30%. 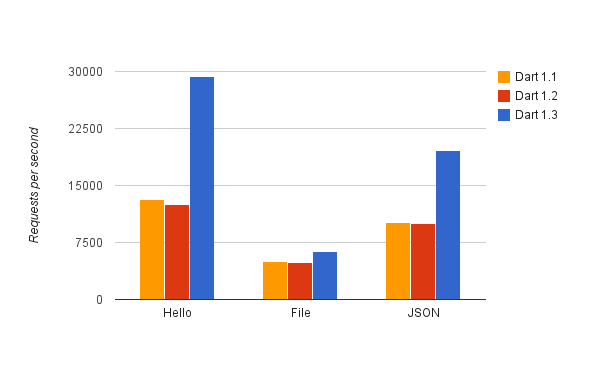 Finally, as a proxy for performance of REST apps, the JSON benchmark nearly doubled in throughput. In addition to great performance, another benefit of using Dart on the server is that it allows you to use the same language and libraries on both the client and server, reducing mental context switches and improving code reuse. The data for the chart above was collected on a Ubuntu 12.04.4 LTS machine with 8GB RAM and a Intel(R) Core(TM) i5-2400 CPU, running a single-isolate server on Dart VM version 1.1.3, 1.2.0 and 1.3.0-dev.7.5. The source for the benchmarks is available. We are excited about these initial results, and we anticipate continued improvements for server-side Dart VM apps. If you're interested in learning how to build a web server with Dart, check out the new Write HTTP Clients and Servers tutorial and explore the programmer's guide to command-line apps with Dart. We hope to see what you build in our Dartisans G+ community.